Find and compare the best prices from a range of well known car rental companies at Zagreb Airport. This is a free to use facility, enabeling you to book direct with the company quoting the price. Zagreb Airport, otherwise known as Franjo Tuđman Airport, is located 8Km South East of Zagreb, the capital and largest city, central Croatia. Zagreb has been called the city of museums and is becoming a popular city destination. A new larger passenger terminal was opened in 2017, with further extenions due in the following 2 years. There is a shuttle bus service connecting the airport and Zagreb, taking about 25 minutes, timed to suit flights. Zagreb airport has 9 restauran/bars, 5 shops, currency exchange, ATMs, a VIP lounge, a business lounge, and FREE WiFi Internet access. Zagreb airport has Airport Carbon Accreditation, at the Reduction level. 3.0 million passengers passed through Zagreb airport in 2017, prepresenting a 11% increase compared to the previous year. 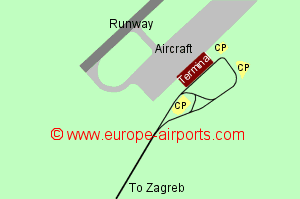 Zagreb is the busiest airport in Croatia.